Maybe Walt Disney was right when he commissioned the song, “It’s a Small World (After All)” in the 1960s. At the time, commercial aircraft and other modes of transportation were beginning to bring folks together from the furthest reaches of the planet as never before. Fast-forward to the 1990s when the spread of the Internet made the world an even smaller place. At the time, large scale chat rooms and instant messaging ruled the day. It was a community meeting place where people with similar interests met virtually even if they were in different parts of the world. These chat rooms provided some of the original allure of the Internet and showed how easily it could make this one small world after all. Since then, chat rooms haven’t really changed. The rooms still bring folks together in the same virtual space, allowing them to collaborate and talk with one another. It’s not cutting-edge; it’s not high-tech. It’s just a good idea that still manages to be highly functional, even after all of these years. 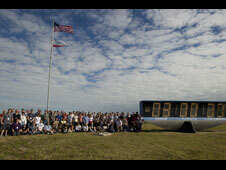 Here at NASA.gov, we’ve previously hosted chats between astronauts, educators and students. Continuing this tradition, from time-to-time we’ll be hosting question and answer sessions between NASA scientists, engineers, and support personnel. 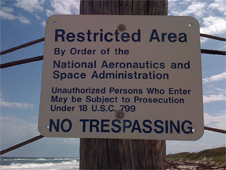 It’s a chance for you to chat with the folks behind that gates at NASA and ask them anything you’d like about a given topic. This afternoon, NASA Chats features Bill Cooke of the Meteoroid Environment Office at NASA’s Marshall Space Flight Center, who will be online to take your questions about the Leonids meteor shower. The shower is a pretty neat thing to see and will be visible over the Americas on Tuesday morning. Join the live chat with Bill Cooke today, Nov. 16 from 4:00 p.m. until 5:00 p.m. EST at: https://www.nasa.gov/connect/chat/09-094.html. As topics come up and neat things are happening at NASA (when aren’t they? ), we’ll have NASA experts answer your questions in future chats. Hopefully, the chat room just keeps proving that “it’s a small world, after all.” Now that’s pretty neat. A big hello from the NASA.gov Web Team at NASA Headquarters. We’re starting this blog to keep you informed about what’s going on ‘Behind the Page.’ We hope to update this on a weekly basis or more frequently as needed. It’ll be the place where we talk about new features in the works, respond to your e-mails and issues, and highlight intriguing things from across the NASA.gov web site. Without any further ado, let’s jump right into the deep end. Some of you have e-mailed us, tweeted us, and inquired over the past few months suggesting that we integrate our social media into the home page more and your wishes are being answered. We’ve been collecting all of NASA’s vast social media presences on a page that’s linked in the top navigation bar under the button “Collaborate.” While that page has several good resources, we’ve found that some folks keep missing the links to NASA’s Twitter, Facebook, YouTube, etc. As a result of this confusion, we’ve surveyed other leading Web sites online. Looking at these sites, we decided that maybe we weren’t calling it what you all were expecting to see. We’re re-labeling that button into ‘Connect’ instead of ‘Collaborate’ as that has become more of a standard label for an organization’s social media section. 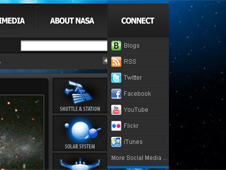 To also help you locate the main NASA social media accounts, we’ve added them to a new drop-down menu that displays when you hover your mouse over the new ‘Connect’ button in the top navigation bar. As always, if you click on the Connect button or the new ‘More Social Media…’ link in the bottom of the drop-down menu, you can reach the main NASA social media page that has all of our links on it. Hopefully, this change will make our top navigation more user-friendly to everyone looking to connect with NASA on social media. Another exciting change that’s been in the works for a while is also being unveiled at the same time. 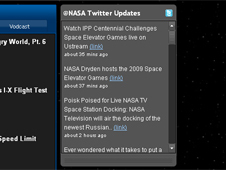 In the right column of the home page we’re replacing our current “Get NASA Updates” module with two new modules. The first presents updates from the @NASA Twitter feed in near-real time ; the second, smaller box allows you to sign-up for NASA updates by e-mail. We hope that displaying the Twitter feed on the home page will show a broader cross-section of material across NASA.gov, including material that won’t fit into our featured spaces on the home page. Additionally, we’re hoping the smaller e-mail subscription box has a better look-and-feel to fit in with everything else going on with the (admittedly, pretty busy) home page. These changes are just the first of a series of tweaks that are coming on NASA.gov as we look at how to streamline our online presence to make it more user-friendly. We know that we have a very dedicated following of folks from every corner of cyberspace. This blog and your comments will hopefully allow us to share insight into what’s in the works here at NASA and also be a forum for us to hear about what you’d like us to work on next. No promises are being made, but we’ll always have an open ear. As always, you can e-mail the NASA.gov Web Team at webcomments@hq.nasa.gov or drop us a line in the comments. We’ll try to respond as time allows, but know that we read every comment and e-mail that comes through the door.